Unique Things to Do In Arizona Every Month! There's Always Something! Find things to do in Arizona every month, in every corner of the state and for every unique personality! Some may be off the beaten path - some of them, maybe a little unusual. We've found the best idea for a day, weekend, a week or a vacation of fun! And definitely for the right time of year - just for you!! Want a great idea for something to do in Arizona? Explore an Arizona City or Town - With a unique Walking Tour! Where is it you're staying - or want to plan a trip? We had a great time doing the hunt. This is a great way to doing something fun on a trip or explore your own city. This company puts together a wonderful Quest.... Everything is well designed.... I highly recommend the Urban Adventure Quest! A really fun game! My daughter and I played it on Mother’s Day and had a great time. It is a fantastic way to learn history of the city, meet nice people, get exercise. We loved that we could do it at our own pace. We could stop for a leisurely lunch. Click Here for More Info & To Get Your Smart Phone Tour Now! There's always something going on here - Even more on Wednesdays through Sundays! Check it out! Click to Get A Great Walking Tour! 4x4 Tours are Always a Top Choice! Ski Arizona! - Arizona is home to the Southernmost ski area in the mainland U.S. - in the Catalina Mountains, adjacent to Tucson. But that's not the only one. Where can you go to enjoy the Arizona Skiing Lifestyle? Mt. Lemmon Ski Valley - From Tucson, Take Catalina Hwy. to Mt. Lemmon Hwy., bypassing Summerhaven & up to the ski resort at the end of the road. 2 chairlifts and 1 tow available. 5 beginner slopes, 9 intermediate & 8 expert slopes. There's a ski school with group or private lessons. Equipment rentals & half-day rates after 12:30 pm. Eat breakfast or lunch Thursday thru Monday at the Iron Door Restaurant & visit their shops. Shops & ski lift rides open in summer. Elk Ridge Ski Area - Formerly known as Bill Williams. It's in ownership transition & currently not open. Near Williams, AZ, it's located on the north side of Bill Williams Mountain. We'll add more when it reopens. The Great Oatman Bed Race - Here's a little weird thing to do in Arizona! Held the 3rd Saturday in January. Come watch the fun. Or join up with a 5 member team (minimum age: 18) - 4 to push & 1 rider. $50 team entry fee. A metal-framed bed on wheels is supplied. There's another hitch - the team must make up a bed with sheets, pillow cases, etc. before the finish line. Call for more details (928) 768-6222. 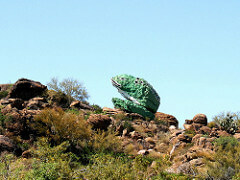 See the Congress Frog & Skull Rock - Drive Hwy. 89 about 1/2 mile North of town to see this iconic local landmark! It's about 16 feet high, probably weighs 60 tons, and he's quite green - especially when he's had a fresh coat of paint (a 95+ year tradition). Another famous local rock is located off Hwy. 89, turn onto County Road 62 (aka Date Creek Rd.). Drive just over 6 miles to see this huge boulder painted white with skull markings. Noted to be decorated as such since 1900, they say! Visit Old Congress Pioneer Cemetery - Circa 1887. Quite a few childhood graves, some unmarked graves. The old Congress Ghost Town is in view from here - not much left. Also near the old mine. The Cemetery is South of Hwy. 93, off of Ghost Town Road. Granite Mountain Hotshots Memorial - About 7 miles from Congress, this memorial Arizona State Park (free entry) honors the 19 Granite Mountain Hotshot Firefighters (see the film: Only the Brave) who lost their lives while fighting the Yarnell Hill Fire June 30, 2013. It's something to do in Arizona that combines a thoughtful, striking memorial with a hike. You go about 3.5 miles from a trailhead to the Fatality Site. Then loop back for a total of about 7 miles. Allow 4 to 6 hours and bring lots of water. Plaques along the way give some background on each firefighter. A shuttle bus to the park runs from the town of Yarnell. Go 2 miles south of Yarnell on State Route 89 to the park entrance. See Organ Pipe Cactus - A National Monument is dedicated to this special columnar cactus. Organ Pipe cactus grow to about 15 feet tall. They're a fairly rare cactus. Roaming around this park, you'll see them here and there! They don't grow any further North than this. You could wait until May to visit - when their creamy white colored flowers start to bloom - for a more showy Organ Pipe visual! But doing this in Arizona - you'd have to be able to take the heat, cause it really has gotten to the 100s by then. Enter the park and take the Ajo Mountain Drive, very scenic! Take Hwy. 86 West (Ajo Rd.) out of Tucson. Turn left onto Hwy. 85 at the town of Why. 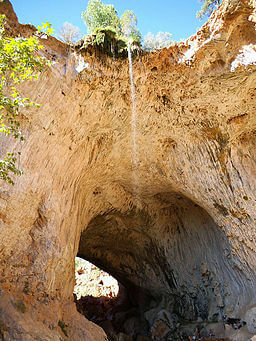 Tonto Natural Bridge - An Arizona State Park, made for seeing this attraction. Erosion formed this natural tunnel through rock, creating a bridge over Pine Creek and canyon. In 1877 David Gowan located it when hiding from Apaches. There are many caves in the area also. See it from many overlooks and trails. From Payson, go 10 miles North on Hwy. 87. Turn on NF-583A. Downtown Phoenix has a Parade & Irish Faire at 10 am., along N. 3rd St. Then head over to the Irish Cultural Center at Hance Park for Irish Music, Stepdancing, pipers, Food, brews & more. Glendale has the Irish Kilt Run, ending with the St. Patrick’s Party at McFadden’s Bar & Grill. Also check out the Irish bands at the Leprechaun Village. Padre Murphy’s sets up a gigantic tent for live music, corned beef & cabbage & so much more! Rula Bula in Tempe is a hub for live Irish entertainment & decor. Chompies award-winning bakery & deli serves all kinds of Irish treats: Leprechaun cupcakes, green & white cookies & even green bagels. For dinner have corned beef, cabbage, boiled red potatoes & fresh-baked Irish soda bread. Fat Tuesday on Mill Avenue teams with El Hefe & Handlebar to host a massive Irish block party. Clancy’s Pub in Scottsdale starts a few days early with corned beef & cabbage + live Irish music on the patio. Try the Pot of Gold Festival in Chandler. It's a 2-day music festival of rock, alternative, & ska punk. Seamus McCaffrey’s fences off for a big St. Pat's celebration. Irish bands, step dancers, pipers all day! In Fountain Hills they get a fountain in Fountain Park dyed green to honor the day. Watch out! They're known to have an Irish party there, too - with Irish foods, brews & music. Tombstone AZ - 2 for 1! It's called the Lady Banksia Rose. Although it’s blooming through the Springtime months, the Rose Festival happens on a weekend in April. Friday evening they crown the Rose Queen and her court, and some other events at the Rose Tree Inn/Museum. Today's Town Marshals are Often on Horseback! A "Picture Perfect" Rose Float! Part of Third St. roped off for the band. Tables & dancing area there. Arm-band ensures only over-21. No cover charge. Take a walk to the Western end of downtown, along Allen Street,to the Four Deuces Saloon. That's where we were on this special Saturday, to sample a unique meal! A few of our friends have said “Never!” – one or two said, tried it once, that was enough!! Only one said he’d had ’em before, and it was alright, he’d do it again. We talked with a visitor – a rancher from Texas who said they did it all the time when it was that time of the year! You may have heard them called "Rocky Mountain Oysters." Ranchers castrate calves and don't let that meat go to waste. They save the testicles for food usage. They’re skinned, ground up, and turned into various food delicacies! Our friend Kate starts talking to us about it weeks before the event. She's one of the cooks. They get about 30 pounds of the, ummm – balls – for preparation. She prepares two different meals. Her husband Dan helps her with the skinning! That's what this event - this kinda crazy thing to do in Arizona - is all about. We're always encouraged by Kate to come over and sample the delicacies she makes. We were a bit leery the first time we went, but decided to give it a try. We looked over everything before choosing the platter. Gene even let me try a little of his sample before actually purchasing. I thought okay – not bad. Another friend, Gene, had deep fried poppers. Hot sauce optional! The platters were to be our lunch + dinner. Bill tried a couple of items, then started on the chili. I started alternating the poppers & other bite sized bits (slowly) with the slider. I figured the slider was most like a normal food – and a favorite of mine, a good burger. Bill thought the chili was pretty good. He ate it all. He ate most of his plate. But he said, one time – that’s it. Not something he’d want to do again. Me? With each bite, I liked it less and less. It may have been mind over matter (I have taught an anatomy course which included reproductive anatomy - that may have contributed!) – but I felt I couldn’t eat more of it. I sampled around the plate. I did have ketchup on the slider – but I only ate about a quarter of it. I probably ate about a fifth of the rest of the plate, and 2 spoons of the chili. When Bill was finished, I said – I’m done too! I just can’t eat any more of this. I just couldn't complete it, phew!! So it was, we were – One And Done!! But the whole event is a kickin' time! Four Deuces also has regular grilled food (burgers/dogs) on hand - for the squeamish. Bands play from the afternoon until closing. Because this event takes place on the same day as The Rose Festival, the Rose Court often puts in an appearance! All in all it's a great time. Definitely - if you're looking for an unusual thing to do in Arizona! Bill starts on his sampler – I started on mine, too! A sampler contained something from each of the six cooks – including a bowl of chili. We chose that so we could try everything. Bill's Holding the Slider He's Eating! Stop Your Car - And Hike a Chiricahua NM Trail! See the Oldest Trading Post - In Northeastern Arizona, at Ganado. The Hubbell Trading Post was begun by John Lorenzo Hubbell in 1878. Located on the Navajo Nation, it's the oldest continuously operating trading post there. But the historic features of the Hubbell homestead can be toured - on your own, or via a Ranger-led experience. It's a very interesting, and historic, experience. Remember that the Navajo Nation, unlike the rest of AZ, does observe Daylight Savings Time. To get there, from I-40 take U.S. Hwy. 191 North. Then Hwy. 264 West to Ganado. Old Chiricahua Apache Homeland - Now a parkland. Visit Chiricahua National Monument in Southeastern Arizona. South of Willcox. Take the scenic drive going to altitudes from 5000 to 7000+ feet. You'll see wonderful rock formations. If you're into camping or hiking - gorgeous availability is here. Take the drive to Massai Point for stunning overlooks. There's also a pioneer homestead to explore, called Faraway Ranch. Take Hwy. 181 out of Willcox. Follow the signs to the turn-off onto Rt. 181 which takes you to the entrance at E. Bonita Canyon Rd. High Country Time! - Flagstaff area for a variety of great adventures. The hottest month of the year in the deserts, means it will usually range from the 70s to low 80s daytime temp in Flag! Great time to visit. Flagstaff Hullabaloo - In downtown at Wheeler Park, 211 W. Aspen Ave. Celebrate summer at this fun community festival that raises funds for local non-profit organizations. It begins with a bike parade on Saturday at 9:30 am. They have a large kid-centered section with trampolines, face painting, and lots more! Continuous live-music on-stage. Luscious food booths & satisfying beverages. Costume contests, clowns, roving characters & so much more! The first weekend in June. Check their website at flaghulla.com or call (877)4.FLY.TIX (435.9849). Flagstaff Blues and Brews Festival - Takes place the 2nd Saturday in June at the Continental Driving Range, 5000 Old Walnut Canyon. As the name indicates, they features blues acts, Grammy award winners, and microbrew stands. There's also a children's area, arts & craft booths, and food vendors. Kids 12 & under are FREE - but must be accompanied by an adult. See flagstaffblues.com or call (928) 606-5601. A great time to be in the White Mountains! Alpine Worm Races - Here's another quite out of the ordinary thing to do in Arizona! Held the first week in July at the Ye Olde Tavern. A rip-roarin' time that started as a focus on the great fishing in the area. It's become a fun tradition that the new owners, Laura & William are continuing. Find them at 42640 U.S. Hwy. 180, near the Junction of Hwy. 191 South. Alpine Area Artisans Festival - Held the first week in July, on multiple days surrounding Independence Day. From 10 a.m. to 4 p.m. on Main Street. Crafts-people show their works: Paintings • Baskets • Jewelry • Beading • Weaving, Collages • Quilting • Photography • Clothing • Wood-Works • Knitting/Crocheting • Amulets, Clay • Journals • Home Decor, etc. Free Admission & Free Parking. For more information call the Alpine Chamber of Commerce: (928) 339-4330. Sunrise Park Resort - It's a Ski Resort in the winter. But what a great place to play in the mountains in the summer! The season begins on Memorial Day weekend. 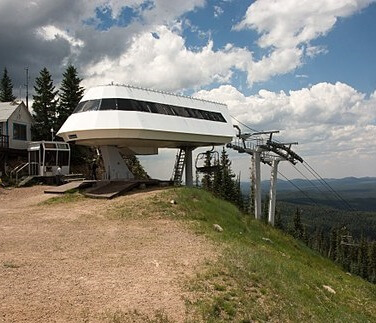 Ride the Ski Lift for terrific views along Sunrise Mountain - with its 10,700 ft. elevation. Take the Mountain Bike Lift: get off on top & bike downhill - what a thrill! Try out some archery, hone your skill. What else? For 6+ years old: Sunrise Super Slide, 2 levels for the Airbag Jump, Bungee Trampoline Jump, and Rock Climbing Wall! Take the younger ones on a nice walk on beautiful trails. Then visit the Eagle’s Nest Cafe for some good eats. Anything you need can be found at the General Store. Find them in Greer, Hwy 260 east to Hwy 273. Turn right to get to Sunrise Park. Cottonwood/Sedona/Prescott areas - Summertime here will be a little warm, but the elevations make it a bit cooler than the heated up desert floors. You can expect it to be in the 90s in the daytime, cooling into the 70s after sundown. So an ideal time for those outdoor summer activities, or some indoor ones. This is monsoon time - so remember to watch the weather forecast. You don't want to be caught out in a thunderstorm! What's so nice about the Monsoon - is the cooling effects of the clouds and a rainstorm. Verde River Greenway State Natural Area - Swim, take a nice canoe or kayak trip, or try a little fishing. Swimming is allowed anywhere along the river. There are no lifeguards, so you're at your own risk. For river crafts, access by put in at the Tuzigoot bridge & take out at Dead Horse Ranch; or put in at Dead Horse Ranch & take out at 89A. Check water levels before your trip. Use caution for the abundance of twists & turns. For fishing, a valid AZ fishing license is required for age 10 & older. Remember if you pack it in, pack it out. Your recreation should have minimal impact on the environment. No loud nuisance noises. No overnight camping. No fires. Off road vehicles are prohibited. Pets must be on a leash. This area is located next to Dead Horse Ranch State Park, at 2011-B Kestrel Road in Cottonwood. Campsites, cabins & facilities are available in the State Park. Airport Mesa - We've been here & had an amazing experience. There's a small parking area, so to find a spot - your timing will have to be right! Then take the main trail off to the left out to the cliff's edge. From the roundabout intersection of Hwy. 89A & 179, go West on 89A which is away from Uptown. 1 mile further watch for the left turn onto Airport Rd. Take that up hill about 1/2 mile, you'll see the parking on the left. Bell Rock - We've also been here. It's a great place, amazing. Lots of parking, and lots of ways to access it, along Hwy. 179, just past the Village of Oak Creek. There's a trail that loops around the front, along the highway. From there you can make your way to the hill, climbing up as you wish - up along stair like ledges. Use caution. Boyton Canyon - We've been near this one, but never did go directly to the vortex area. Go west on Hwy. 89A out of Uptown. 3 miles out at the Dry Creek Rd. traffic light, make a right onto Boynton Pass Rd. At the end, turn right to Boynton Canyon Rd. Go just 1/10 mile to the trail's parking area, turn in on the right. Cathedral Rock - This is one we have yet to try. It's a short hike, but very steep. The vortex is in the saddle, between the spires. The trailhead is at 500 Back O Beyond Rd., accessed from Hwy. 179 going toward Uptown Sedona, at the roundabout after passing Bell Rock. Another place where caution is needed. Arizona Cowboy Poet's Gathering - Cowboy poets, singers & musicians get together in this yearly tradition in Prescott. Listen to them present the culture of the American Cowboy. Thursday, Friday & Saturday in early August - held on the campus of Yavapai College. They're a 501(c)(3) organization, who work to preserve the culture and heritage of the American West. For information: acpginfo@gmail.com or call (928) 713-6323. Here I am - Standin' On the Corner - Do You Remember the Rest of the Song? "Standin' on the Corner" Park Festival - Come on over! Be a fine sight!! At the Eagle Pavilion, 523 W. Second St. on the last Friday & Saturday of the month. Live bands, arts & crafts, food, live auction, beer garden, dancing, kid's play area, fire truck tug & more fun. $5 entry. For further info call (928) 289-3434. La Posada Hotel - A stop you'll want to make, and perhaps make it your overnight stay. Beautiful grounds, gorgeous rooms at reasonable rates, book store and library, and gift shop. Fred Harvey built this hotel - of the famed "Harvey Girls" system of travel accommodations. Architect Mary Elizabeth Jane Colter was asked by Harvey to design the hotel, this "resting place" - finished in 1929. It was to be the finest in the Southwest. After the stock market crash, at times the hotel and building barely survived. From 1994 to 1997 efforts began to save it and restore it. In the 1930s, it was a favorite stop for the Hollywood stars. Other notable figures have stayed here as well. Maybe you'd like to? It's located right on Rt. 66, toward the Eastern outskirts of town. Call (928) 289-4366. 9-11 Memorial Garden - Remembrance dedicated to the tragedy September 11, 2001 and the promise: “we will never forget.” On the corner of E. 3rd St. & Transcon Lane, take Exit 255 from I-40. The centerpiece of the garden is actual wreckage from the World Trade Center. The 14 & 15 ft. beams were bestowed to Winslow citizens by the City of New York. They're the largest pieces given to any community in the nation. Tom Mix Memorial - Driving North from Tucson to get to Florence, you'll likely take Hwy. 79 - Pinal Pioneer Parkway. Along this road, on October 12, 1940, Western film star Tom Mix had a car accident. A barrier was in the road, because of a wash-out from a flash-flood. He swerved at the last minute, his car overturned, a suitcase flung into his head from the rear. His neck broke, and he died. The nearby wash is named for him. Check for the rest-stop between Mile Marker 15 & 16 - there you'll find the monument in his honor, 15 miles before arriving at Florence. He was a friend to Wyatt Earp - a pall bearer at his funeral in 1929. St. Anthony's Greek Orthodox Monastery - A beautiful desert oasis built by monks starting in 1995. A self guided tour is available. Check in at the bookstore right at you enter. Be warned that you must have proper attire - conservative, modest, nothing sheer. Women must wear a skirt & have a scarf-type head coverings, but not hats. Men must wear a hat. Some borrowing-wear is available, if you brought the wrong items. No smoking on the premises. No speaking with the monks. Also - photos are allowed, but not of the monks. The location is off Rt. 79, 12 miles South of Florence. Take Paisano Road to 4784 North St. Joseph’s Way. The grounds and architecture are worth the experience! In Town - Florence has preserved true Old West history. There are about 140 buildings that are historic, from as early as Territorial Days. Check in to the Visitor Center - a historic building itself & a state park. It's downtown, at the corner of Main & Ruggles, where you can get a self-led walking tour. It includes the historic courthouse and the Silver King Hotel. Visit the Andy Devine Room - Kingman's native son has a special place at the Mohave Museum! Although born in Flagstaff, he moved to Kingman in his 1st year. You'll see the street named for him when you get to town. He was once a semi-pro football player. His first show biz gig was on the Jack Benny Show. Many baby boomers knew him from his series "Andy's Gang" with his famous line: Plunk your magic twanger Froggie! Well known as Cookie, the sidekick of Roy Rogers in 10 movies. Another famed role was Jingles P. Jones, Wild Bill Hickok's pal. He played a sidekick in about 400 movies, Westerns in particular. While there, check the other exhibits, like the outdoor display of ranching & mining machinery & a 1923 railroad caboose. Located at 400 W. Beale St., right in Historic Downtown Kingman. Monolith Garden Trail - Multi use: hikers, horseback, mountain-bikers, runners. Loop trails wander amidst 7 miles worth of Mohave Desert vegetation and volcanic rock formations. Very little shade - have lots of water. To Trailhead: From I-40, take U.S. Hwy. 93 exit (W. Beale) West. Drive 0.1 mile, after Fort Beale Dr. on the right, take next left: Metwell Drive. Then to a right turn on a dirt road, about 50 yards to the trailhead. Verde Canyon Railroad - A rare treat! Take a ride through this remarkable canyon on a vintage restored train. Travel 20 miles for 4 hours, and be astounded at the sights, while you're treated as a privileged guest. Leave at the depot Near Sedona, in Clarkdale. Many options are available for your trip. Including every weekend evening from Dec. 1 - 23, guests have a bird’s eye view of a Magical Holiday Village, plus a light-show special on the decorated train during a special nighttime run to Santa’s workshop. For more information email them at info@verdecanyonrr.com or call (800) 582-7245. Annual Boat Parade of Lights - In Lake Havasu City, along Bridgewater Channel beginning in Thompson Bayand, it continues under London Bridge, goes to the north end of the Channel. Then turns around at Windsor Beach and goes back. It all happens starting at 6:30 pm until 9 pm, the first Saturday in December or the last Saturday in November - depending on how it falls in the year. Call for specific details: (928) 486-4159. Winterhaven Festival of Lights - Plan for a Tucson stay! A great winter holiday vacation spot! While there, this is a wonderfully extraordinary holiday treat. Residents of the Winterhaven community, near Country Club & Fort Lowell, decorate their homes and yards for the holidays. They go all out, voluntarily! Most of the neighborhood participates as a gift to the community and city. Walk through or take a wagon ride, bus trolley, or a pedal-powered group bike. Driving permitted only on one drive-thru night. 5:30 to 10 pm. It's free to enter - but a donation for the Food Bank is asked. Usually ongoing from the 2nd week in December until the day after Christmas. Keep informed of details on their Facebook Page.